Perched at an altitude of 3293 meters above sea level, Yamunotri is situated in Uttarkashi district of the Garhwal region in Uttarakhand State (Uttarakhand State referred to as 'Devbhoomi' or 'Land of the Gods' famous for its pilgrimage and spiritual centers). It is very close to the Indo-Chinese border and is surrounded by the Himalayan offshoots on all sides. Yamunotri is at a distance of 180 km from Dehradun, 214 km from Rishikesh, 176 km from Chamba, and 21 km from Sanya Chatti. One of the Char Dhams according to Hindu mythology, Yamunotri is the origin of the sacred river Yamuna which originates from the Champasar Glacier on the Kalinda Parvat at 14,502 ft. It is 1 km further up from the Yamunotri shrine, but its is not accessible. Yamunotri is famous for its temple devoted to goddess Yamuna and thermal springs at Jankichatti and glaciers. 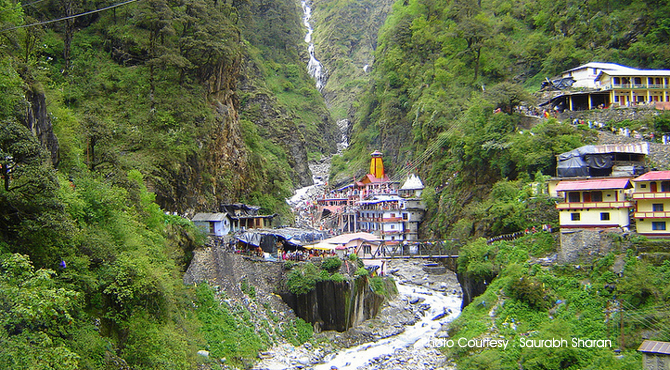 Legend has that, Yamunotri was the home of Asit Muni, a famous sage of ancient times. Devotees take water from Yamunotri to offer it to Krishna in their homes during Janmashtami or any other occasions related to Sri Krishna because Goddesses Yamuna is fourth among the eight principal queens of Lord Krishna. A belief that, a bath in Yamunotri will relieve a person from a painful death and lead to the attainment of moksha. Yamuna and Yama (Lord of Death) are believed to be the children of Lord Surya, the Sun God. Yamunotri Shrine is the western most shrine of the Himalayas perched atop a flank of Bandarpunch (Monkey tail) peak at a height of 3293 mts. The temple itself stands on the foothill of Kalinda Parvata (Parvata means hill) close to a thermal springs. The Yamunotri temple was built in the year 1839 by Tehri Naresh Sudarshan Shah, later the temple was built by Pratap Shah but it has been destroyed due to natural calamities twice. The temple has been reconstructed many times and in 1994 Surajmal Jalan Trust renovated the temple. Now Yamunotri temple is under the Panch Panda Samiti. The deity of the temple is in the form of a silver idol adorned with garlands. Inside the temple also has a white deity of Goddesses Ganga. The temple opens every year from 6 am to 8 pm on on the auspicious day of the Akshya-tritya (April - May) and closes on Yama Dwitiya (the second day after Diwali, November). The temple is closed for the winter season and the deity is taken to Kharsali Village (2 km from Janki Chatti across the river) during winter. Aarti timings of Yamunotri temple are from 6:30 pm and 7:30 pm and special pooja is organized in Yamunotri on the eves of Janmashtami and Diwali. One have to trek from Janaki chatti or from Hanumanchatti to reach this temple. The trekking distance is about 12 kms. Ponies (mules), palanquins and Porters are available on hire. The trek along the riverbank is mind-blowing. One can see beautiful valleys, tall waterfalls with the mountains rising up on each side. It is a picturesque route and the last 5 km is steeper. The Yamuna Valley known as Rawaai Ghaati, is more spectacular for its scenic beauty. The roads are very narrow with frequent twists and the vegetation is lush. Next to the temple is the Divya Shila, a rock pillar, which is to be worshipped before visiting the main temple. Aside from the temples, there are various hot water springs in Yamunotri. The most famous is the Surya Kund or Suryakund dedicated to lord Sun. It is situated next to the Divya Shila. Named after Surya or the sun god, the father of Yamuna, it is believed it is the blessing of Surya for his daughter. It is also famous for its remedial properties also. The tank has full of boiling water into which the principle offering to Yamuna goddess, i.e; rice and potatoes tie in a cloth and dip it in it till it cooked and this is offered to the deity in the temple, and returned to the pilgrim as prasad. Usually Pilgrims take a holy dip in the hot waters of the Taptkund next to the temple which gets its water from the Suryakund nearby. There are separate bathing tanks and area for men and women. The other hot water spring is Saptarishi Kund, which is 10 km away. Usually covered with ice, it is a natural lake and a beautiful picnic spot. It is also famous for the rare Brahma lotus. On the return to Hanuman Chatti, one can reach Kharsali, 1 km away, which is the last village in the region. Kharsali , the mind blowing meadow is the most famous tourist location in this region. It is famous for its thermal springs. The village offers fine views of the mountains and Oak and conifers trees. It has a three-storied Shiva temple namely Someshwar Temple. The temple has carved stones on the walls. Dedicated to the Lord in the form of Someshwar, the God of the intoxicant Soma. The intricate woodwork here is also noteworthy. There is another temple 'Shani Dev' looks like the tower monasteries of Tibet. It is 49 kilometers away from Yamunotri. It has an ancient temple. Badkot offers a calm and divine atmosphere to all those who came here. It is 13 km from Yamunotri Located at the confluence of the Hanuman Ganga and Yamuna rivers, it is the base of 12 km trail to Yamunotri temple which is nestled at the base of a mountain Bandarpoonch.